Granite Counter Tops. Silver Appliances. Maple Cabinets. 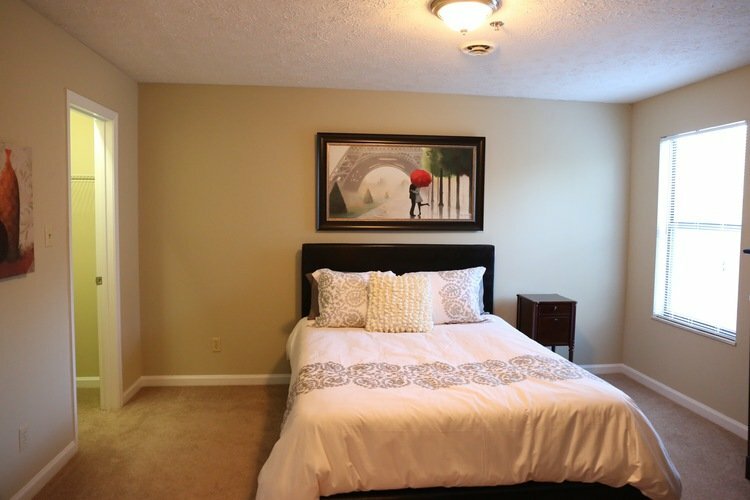 2-Bedroom and 3-bedroom apartments in a luxury West Knoxville, TN, setting. Why live in a traditional apartment when you can live around your own private spring-fed lake in a beautifully designed and spacious apartment home? 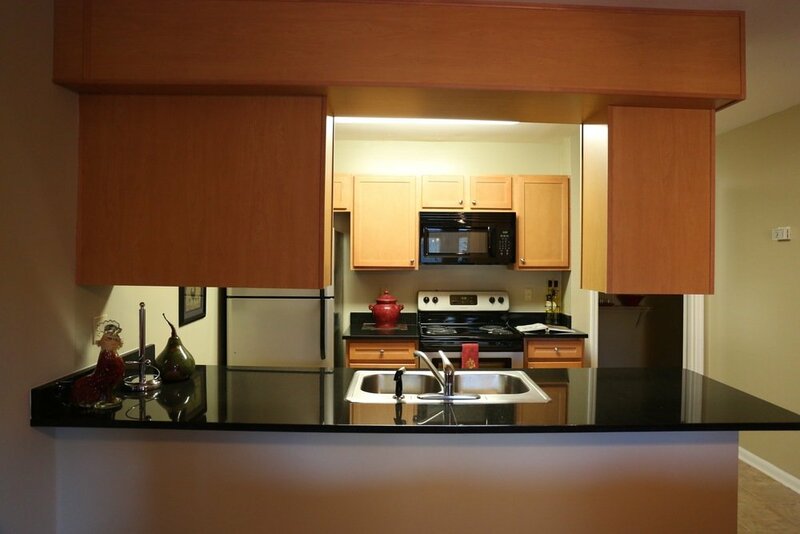 The 2-bedroom and 3-bedroom apartments for rent at Fox Lake Apartment Homes, in the heart of West Knoxville, TN, feature beautiful black granite counter tops, open floor plans, new silver and black appliances, decorative oil rubbed bronze light fixtures and maple cabinetry. Each apartment includes large walk-in closets, washer/dryer hookups, a private patio or deck, cable and high-speed Internet-ready wiring and more! Several apartment layouts, including the Dover, Ellington and Abbington floorplans, are perfect for roommates due to their split layout (Dover and Ellington), with each bedroom on separate ends of the living space, and the identical bedroom sizes of the Abbington along with each bedroom's large walk-in closet. The 3-bedroom apartments boast large living spaces with a total of 1,213 square feet, walk-in closets, breakfast/dining area, and even vaulted ceilings on select top-floor apartments. All of the 3-bedroom apartments available for rent at Fox Lake are located on either the 2nd or 3rd (top) floors of the buildings. The 2-bedroom apartments are located on either the ground or first floor and on the 2nd floor of the buildings. Whatever it is you are looking for in an apartment, Fox Lake Apartment Homes has what you need: on-site professional management and leasing staff; 24/7 emergency maintenance; playground; outdoor stacked-stone fireplaces, gathering areas and charcoal grills and BBQ areas; 2-acre spring-fed lake stocked with fish; 10-acre nature and wildlife preserve; both paved and wooded jogging trails; tennis court; on-site storage units available for rent; two sparkling resort-style swimming pools; 6-person hot tub open all year; fitness room; fully-furnished club house with kitchen; two shared laundry facilities; and a NEW Dog Park. Our convenient location, in the Cedar Bluff area of West Knoxville, provides close proximity to many of Knoxville's best dining and shopping options, nestled within a quiet and beautiful apartment community. Scroll further down the page to see all of our floorplans and apartment layouts below, including detailed descriptions, photos, HD Video Walkthrough Tours, floorplan drawings and pricing, then Contact Us to learn more or schedule an on-site property visit and model apartment tour. The Dover floorplan features 2 bedrooms, 2 full bathrooms and ground level entry in 1,140 square feet. Chadwick Model at Fox Lake Apartment Homes. 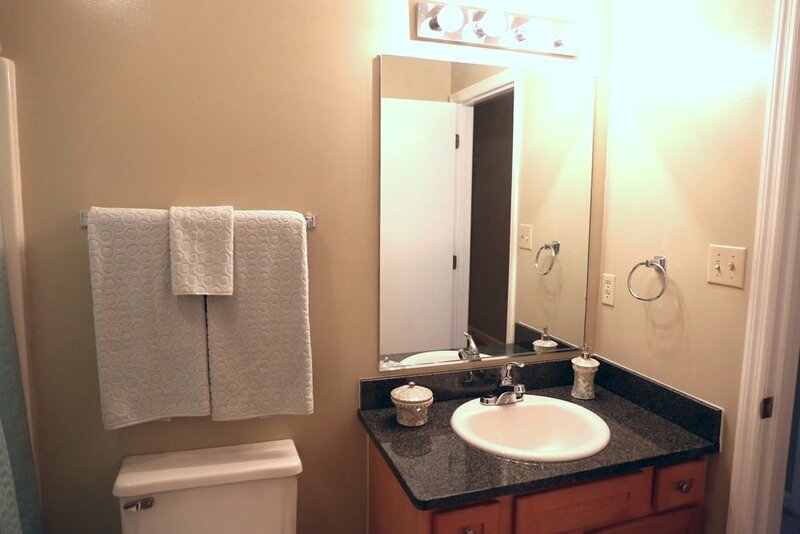 3 Bedrooms, 2 Bathroom, 1,213 square feet, from $965/month. 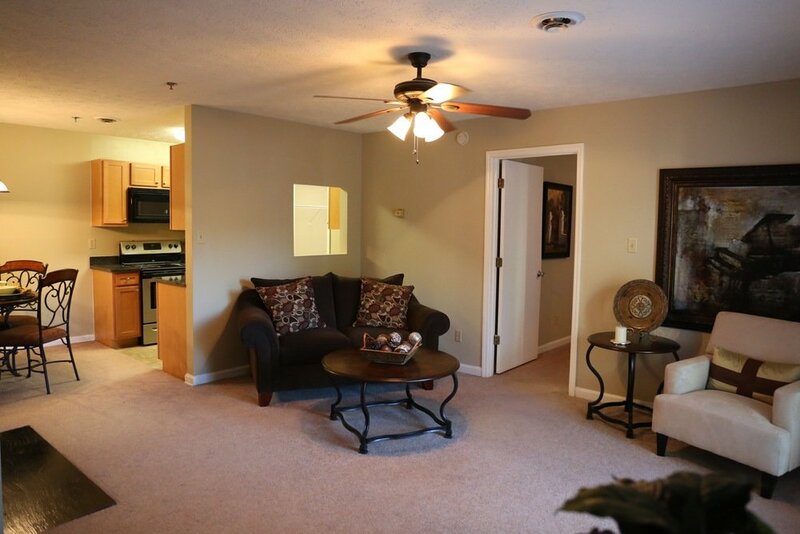 Gatwick Floorplan at Fox Lake Apartments in West Knoxville, TN. 2 Bedrooms, 2 Bathrooms, 1,127 square feet, from $949/month. Abbington Floorplan at Fox Lake Apartments in West Knoxville, TN. 2 Bedrooms, 2 Bathrooms, 954 square feet, from $855/month. Foxboro Model at Fox Lake Apartment Homes in West Knoxville, TN. 2 Bedroom, 2 Bathroom, +Bonus Room, 1,168 square feet, from $950/month. Ellington Floorplan at Fox Lake Apartments in West Knoxville, TN. 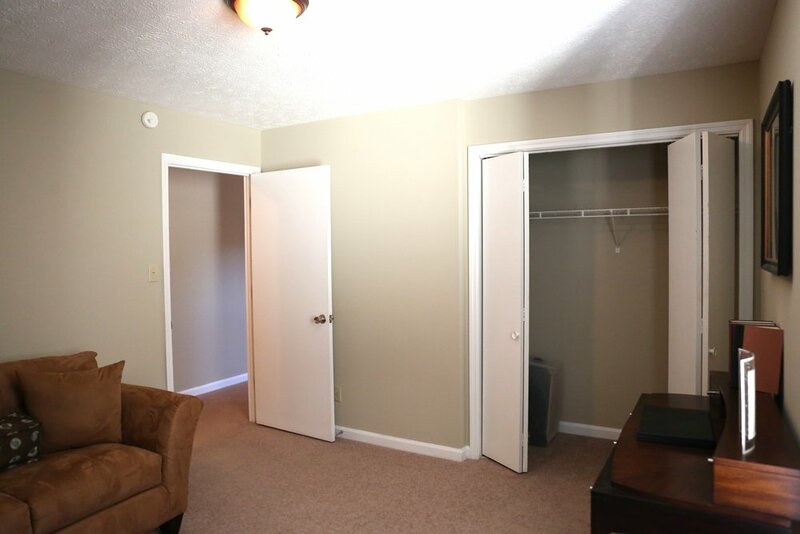 2 Bedrooms, 2 Bathroom, 1,140 square feet, from $955/month. Burwell Model at Fox Lake Apartment Homes in West Knoxville, TN. 2 Bedrooms, 2 Bathrooms, +Bonus Room, 1,094 square feet, from $915/month. Kitchen with granite countertops in the Abbington floor plan at Fox Lake, West Knoxville apartments for rent. 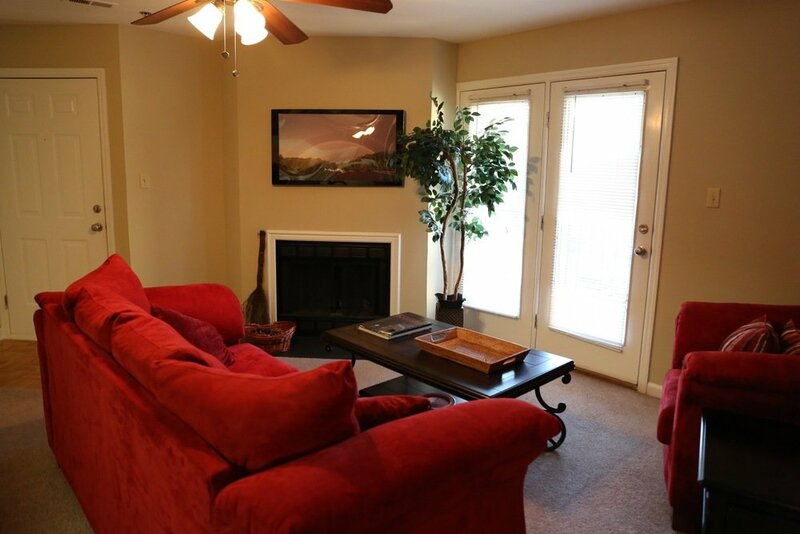 Living room with fireplace in the 2 bedroom, 2 bathroom Abbington apartment at Fox Lake Apartments in Knoxville. *Note: Apartments in Building 4 are pet-free, have black appliances and do not have granite countertops.